The wines from the Rías Baixas Denomination of Origin are the result of a marriage of unique grape varieties, grown on extraordinary land by patient, tenacious people who have known how to preserve tradition while taking advantage of the latest advances in technology. Growing the vines in the Rías Baixas territory is a laborious process that requires a lot of attention, due to the multiple challenges posed by the climate and the terrain’s morphology, as well as the delicacy of the local varieties of vines. For example, a need for sunshine, combined with excessive humidity, have made wine training the most traditional method of winegrowing in the Rías Baixas region. This method allows for maximum sunshine, while keeping the vine away from the humidity of the terrain. However, wine training isn’t the only winegrowing method of Rías BaiXas. We’ll also find other methods such as trellis systems. Harvest requires exhaustive control on behalf of the Regulatory Council of Rías Baixas Denomination of Origin, which takes care of everything from the moment of harvest, as well as the quantity and quality of the grape. Normally, harvest takes place during the month of September and beginning of October. The start date varies from one region to another, seeing as harvest varies depending on the area. Before beginning with the harvest, ripeness tests are done so as to determine the optimum moment to start harvesting in each area. In order to do so, the potential alcohol content of the grape is analysed and, in some cases, the total acidity of the wort. For the gathering, boxes of up to 20 kg are used in order to keep the grapes in optimum condition. The harvest of the Rías Baixas Denomination of Origin is done by hand, mobilising around 30,000 workers. It was calculated that, in 2010, the region obtained a total production of 30 million kg of grape. Despite the wineries having very similar wine creation processes, each winery manufactures a wine that is different from the rest, due to the distinct selection and treatment of the grape, as well as applying different processes. In this way, each winery can offer a unique wine, with even the same winery offering various distinct brands and labels. Each wine has its own character, and a huge amount of effort and work behind it that is only known by the workers themselves. 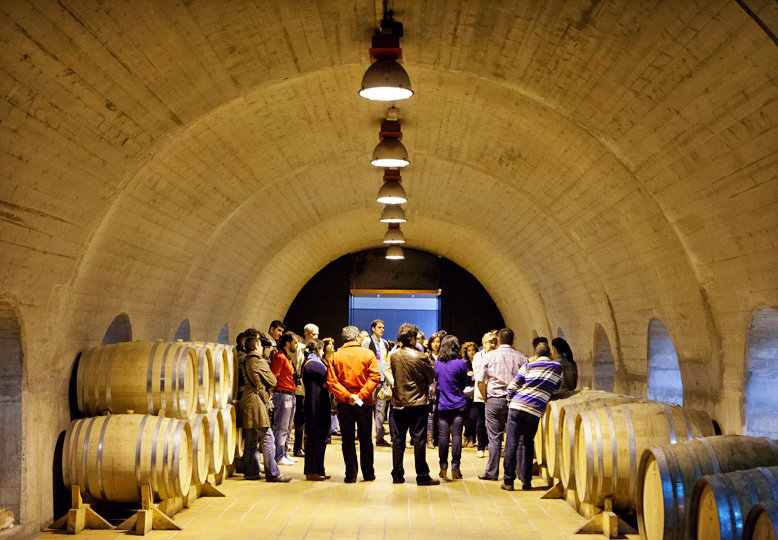 The Ruta do Viño Rías Baixas offers the possibility to visit our region and discover our wineries, to get to know first hand why our wines are so unique. – Maceration: Once the grapes have been collected and gone through all harvest and winery access tests, we can proceed to maceration. In this process, the wort, pulp and skin (after prior stem-removal and pressing) are kept in contact during a varied period of time, but always at low temperatures below 8ºC. The goal of the cold maceration technique is to extract the unique varietal aromas from the cells of the skin. This step is optional and is not done by all wineries. – Pressing: the mission is to extract the wort via pressure exerted on the grapes. In Rías Baixas, this process is typically done by mechanical presses. The prior crushing and/or destemming is optional. – Debourage: a process that consists of cleaning the wort to separate and strip it from the larger particles it may contain. In Rías Baixas, debourage is typically static and with use of cold. – Alcohol fermentation: is typically done in stainless steel tanks and at a controlled temperature (around 18ºC). – Malolactic fermentation: this second fermentation is done to adjust the acidity of the wine. The lactic yeasts trigger the fermentation of malic acid which is transformed into lactic acid and carbonic acid. Interesting to note in this phase is a new, minor line of production that consists of fermentation and/or maturation in oak casks. 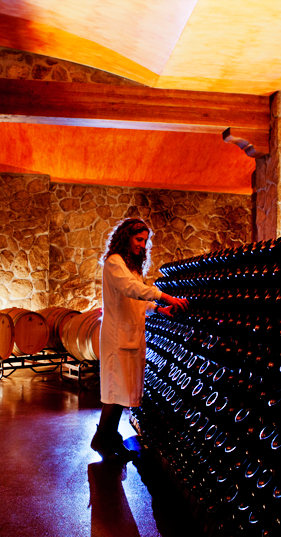 – Racking: after fermentation, the goal is to separate the wine from the lees, as quickly as possible. – Clearing: to eliminate solid suspended particles. Clearing is done via precoating and/or filtration. – Tartaric stabilisation: is where the wine is subject to a temperature of about -4ºC during 7 to 10 days. If it is sowed with potassium bitartrate crystals, this time can be reduced to half. This process gets rid of tartaric deposits. 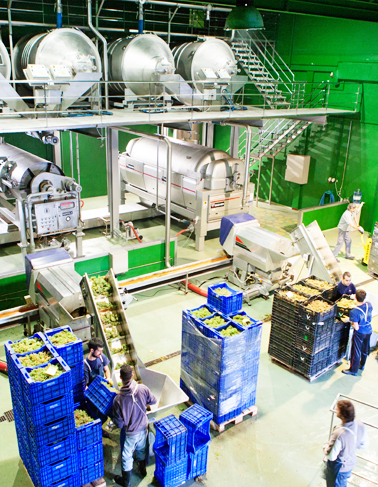 – Bottling: the wines of Rías Baixas can be bottled early, even before the year in which the grape was harvested has ended. Many also bottle amy subsequent lots depending on demand; or, in a single later bottling in Spring or Summer.